Arsenal fans will be licking their lips in anticipation after Mesut Ozil and Jack Wilshere starred on the international stage before they link-up in the Premier League. Ozil gave us passing, posture, and a pre-match prayer. He made his first appearance since becoming Arsenal’s record signing and delivered a performance here in Munich that indicated why Arsene Wenger had finally thrown off the spending shackles and splashed £42.5million of cash. Wilshere was commanding at the heart of England’s midfield during the stroll against Moldova at Wembley and was only brought off in the 60th minute to preserve him for more testing times against Ukraine on Tuesday. There was no goal – and no assist for that matter – but Ozil’s finessed touches and phantom movement in Germany’s 3-0 World Cup qualifying win over Austria would only have left Wenger grinning widely. He came deep to collect the ball and glide forward with it, using an almost undetectable turn of acceleration, and also pressed high up when out of possession. There were one-touch passes, clever runs, and jinking turns – all pivoted around that magical left foot. His ability to receive the ball under pressure and adapt was most impressive. And as our touch maps (below) show, Wilshere generally plays slightly deeper than Ozil – whose sphere of influence is centred in and around the edge of the penalty area. They seem ready-made to work their magic together. Ozil started in the No 10 role that will surely be his at the Emirates, operating in the middle of a front three behind lone striker Miroslav Klose. 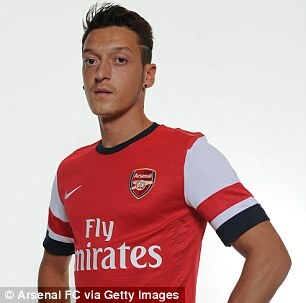 It is the same 4-2-3-1 system employed by Arsenal and he should fit in seamlessly. At times he roamed into left and right channels, always searching for that angled ball to set an attacker clear. Despite his waif-like physique Ozil, a devout Muslim hence that prayer, was also tough enough to withstand a couple of clatterings – one from Stoke City newboy Marko Arnautovic. His finest moment came in the 28th minute with a signature slide rule pass to put Marco Reus free in the area. His shot was smothered by Austria goalkeeper Robert Almer but that should not cloud the fact: Theo Walcott, Olivier Giroud and Wenger will all be licking their lips.